Cape May's History in a 100 Year Old Post Card! Cape May has so much incredible history, which isn't surprising given that Cape May is this country's oldest shore resort. The Longfellow Guest House enjoys a unique a part of that history since our address is on the oldest residential street in Cape May, Hughes Street. Not to mention we've had that distinction since 1851. So when you enjoy your Cape May vacation in our home, you are smack dab in the middle of the historic victorian district, surrounded by the architecture, history, and interesting landscape that defines the heart of soul of of this town. Look at this fantastic old postcard we discovered recently in our family archives. It's a hand painted postcard from 1903 or earlier (that's the postmark on the stamp), looking down Hughes Street from about 3/4 the way up the first block. If you stand in the exact place today you'll recognize those three houses indicated on the left. And our home would be down about five houses on the right. It's quite amazing to see how wide the streets were back then, though that may just be the depiction in this card. Look at the simple bike the kid is on, and his knee high knickers, and how well dressed the adults were - we've found that to be consistent in all our old photos - including shots of people going to the beach in their three piece suits. Our vacation home features lots of old photos that we've hung so our guests can enjoy them too. They are throughout our home. 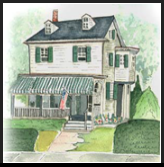 We find that sharing old family artifacts or photos that capture Cape May's history, really helps to connect people with what makes this town so unique, and makes them feel the special charm of Cape May while they are here enjoying their family vacation. We'll post other fun images as we find them in our archives. Feel free to comment below if you have a question or can add some further helpful insight to this postcard. Posted on November 7, 2010 by Michael and filed under Longfellow Recommends.